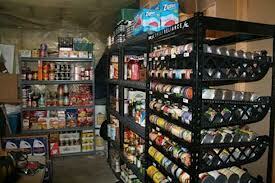 Choosing the right kind of food storage shelving will really help you to organize your supplies for a TEOTWAWKI event. You'll want a system that will put everything right where you need it as looking after yourself and your family for the first few days is going to be hard and anything that you can do to make it easier is surely worth doing. The first thing that you'll need to think about when constructing your food storage shelving is where it's going to be. Your current kitchen will already be full of cupboards and shelves, but in an apocalyptic scenario, your house might not be safe for cooking or food preparation. Therefore, your shelving systems need to be in whatever back up shelter that you have set up for an emergency evacuation. 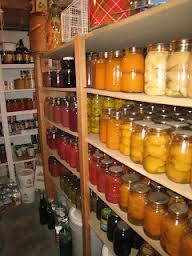 However, if you do plan to stay in place, then the ideal place to build your long-term food pantry is going to be where the temperature will remain cool; a basement or root cellar being ideal. If you don’t have a basement, then you can turn a spare room into your food storage pantry by lining the walls with insulation, blocking all windows, and even placing insulation over the windows. Then set up a fan or even a small window air conditioner to keep the temperature low. 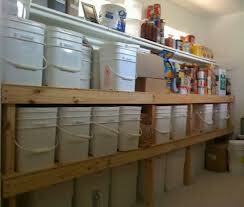 Once you have the location ready, now you can start building your food storage shelving. It is possible for you to simply erect a set of wire mesh shelves and leave it at that. However, this probably won't take the amount of weight of canning jars and dry food that you're going to need to put aside, and the flat nature of the shelves will mean that you won't be able to see all of your options. Strength - your shelving system should be made from the strongest material possible as you'll be storing months’ worth of food on it at any one time. This will amount into the hundreds of pounds for an average-sized family and the last thing that you need to worry about is having your shelves buckle or collapse. Rotation - if you're willing to spend a little more on your shelving system, you should buy one with rotating racks as you might see in a paint store. This will allow you to maximize your space by putting all of your dry goods in separate racks that you can then spin round to see all of your food options. The racks look like mesh baskets and again you'll need to make sure that they are appropriately strong for the amount of food you're storing. Height - you'll also need to look at the height available for your shelving units. Often, emergency shelters have lower ceilings than kitchens and pantries, so you'll have to do some fine measuring to make sure that you can fit the units you've chosen. One answer to this is to buy a system where the shelves stack on top of each other, as this will allow you to create units of exactly the right height. 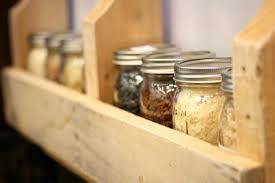 When you're planning your system, don't forget to make space for different sized storage containers. In an apocalyptic scenario, it's highly unlikely that you'll have access to clean running water for the first few weeks, so your shelving system will need room for large water tanks, either on the shelves themselves or on the floor nearby which will limit the amount of storage space. You'll also have numerous large cans of food for bigger meals and large containers for non perishable goods like rice and flour which will need plenty of space. If you're serious about getting the right food storage shelving it is worth investing in the time and effort to draw detailed plans of your space, down to a quarter inch scale, so that you can maximize the use of the space. You can also get professional advice from most hardware stores about the strongest kinds of shelves, as well as looking at specific shelving units aimed at survival scenarios on the internet. A combination of systems will often be best as you can then pick and choose the parts that fit your space and suit your needs. Of course, if you’re handy, you can make some incredibly strong food storage shelving using 2 x 4’s, plywood, and some 2 ½-inch screws. Don’t forget to place a jar-stop wooden slat across the front of the shelves to keep glass jars from falling in a small earthquake.